Google plans to offer Nexus One as invite only? 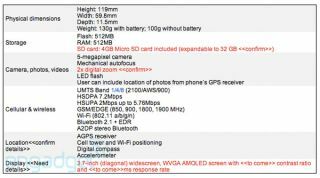 The Google Nexus One phone has been 'leaked' once more - only this time it appears to be the full spec list on offer. And according to sources from Engadget, the phone will only be available on an 'invite-only' scheme when it's first released, which appears to be from 5 January. The specs don't tell us a huge amount that's not expected/already heard, but it's nice to get some 'confirmation' that it will have a 3.7-inch OLED screen, a 1GHz processor and have a 4GB microSD card in the box. Other than that, it's the expected 5MP camera with autofocus and LED flash, Wi-Fi, Bluetooth 2.1 with A2DP, Teflon-coated back (like the Hero) and a trackball. There's no word on how much the Nexus One will be, or when it will be leaving US shores, but we can't imagine it will be too much longer after the US launch, given that Google employees the world over have been given one to play with. Any more word on this (quickly updating) Nexus One saga, we'll let you know.